Jeffrey Campbell has been my favorite shoe designer from the moment I first discovered him a few years back. The brand is great because they offer such a wide range of styles, catering to everyone from the edgier punkish fashionista to the preppyish girl going to lunch. I personally find myself on the safer side of JC’s creations, but I love the little details that make his designs just a little more special than your average shoe. Information on JC is extremely hard to find. I had to e-mail someone within the company to get only the teensiest bit of info, because they purposely don’t put it out there. JC was started out of a small garage in LA in 2000. It began as a small, family run company, and despite world wide recognition and acclaim, remains so to this day. The JC Team creates footwear that combines fun shapes, insane prints, and outlandish combinations with on-trend colors and materials, season after season. Although primarily based in LA, there are satellite offices in NY and Spain. Despite the massive success, JC continues to be operated out of a garage. 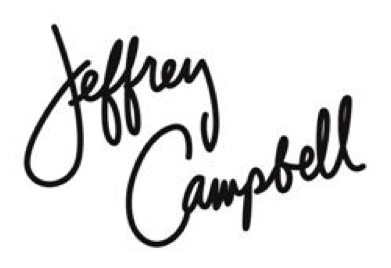 Oh, and yes, there is an actual Jeffrey Campbell designing shoes, but good luck finding a picture of him. Guess a little mystery and incredible designs are the perfect recipe for success. Shop on JC girls! This entry was posted in Accessories, Fashion, spring 2012, Style, Trends and tagged fashion, jeffrey campbell, shoes, spring 2012 by cea green. Bookmark the permalink.